Congratulations to Jaci Gordon of San Diego, CA for being the lucky winner of the Give Thanks Giveaway! She will receive an autographed copy of my debut album Whiskey & Lace before it is available in stores. 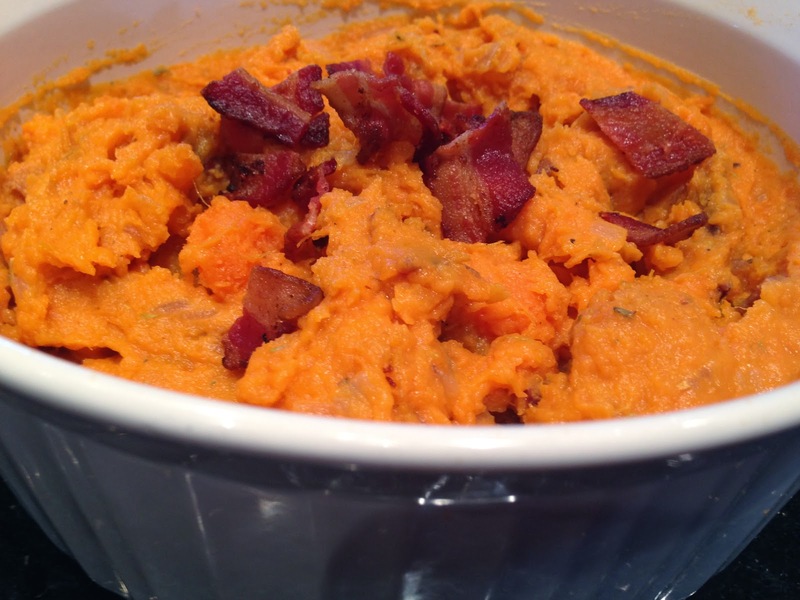 Jaci submitted her recipe for Sweet Potatoes with Bacon which was included in the Keith Family Thanksgiving Feast this year. 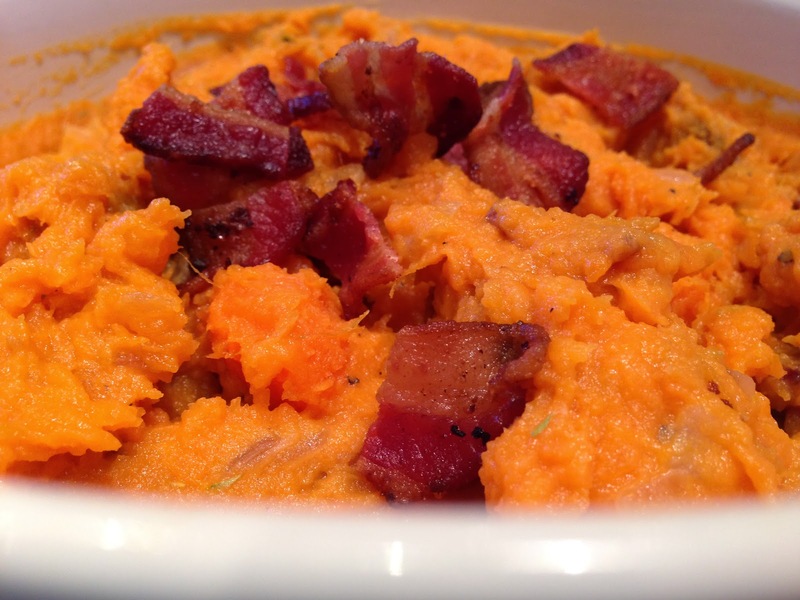 The dish is a yummy and healthier alternative to the traditional candied sweet potatoes. Delicious healthy ways to prepare sweet potatoes always catch my eye. Jaci's recipe along with the other photos of the dish, as it appeared on our dinner table, are below. Thank you all so much for your submissions, there were so many amazing dishes to choose from and believe me...it was NOT an easy task to decide on only one. I hope you guys had an amazing Thanksgiving and had the opportunity to give thought to all the things you have to be thankful for. Heat oven to 350°F. 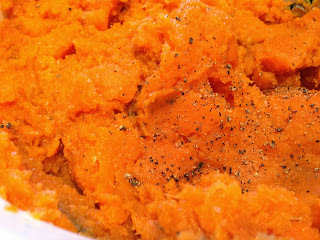 Pierce sweet potatoes all over with fork; place on cookie sheet with sides. Bake about 1 hour 15 minutes or until tender when pierced with fork. Let stand 15 minutes or until cool enough to handle. Meanwhile, in 10-inch skillet, cook bacon over medium-high heat 4 minutes, turning occasionally, until brown. Remove bacon from skillet; place on paper towels to drain. 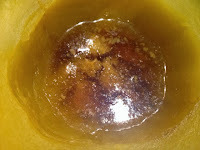 Reserve 1 tablespoon drippings in skillet; discard remaining drippings. Add onion to skillet; cook over medium heat 5 to 8 minutes, stirring occasionally, until softened. Peel sweet potatoes; place in large bowl. Mash until no lumps remain. 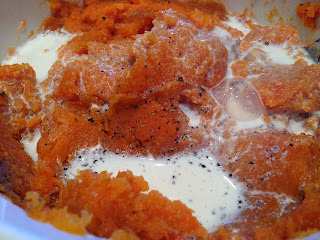 Add warm half-and-half, thyme, salt and pepper; mash until very smooth. 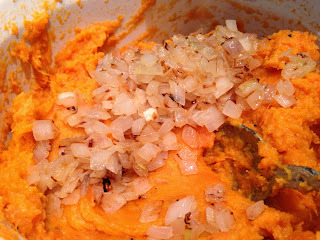 Add onion to sweet potatoes. 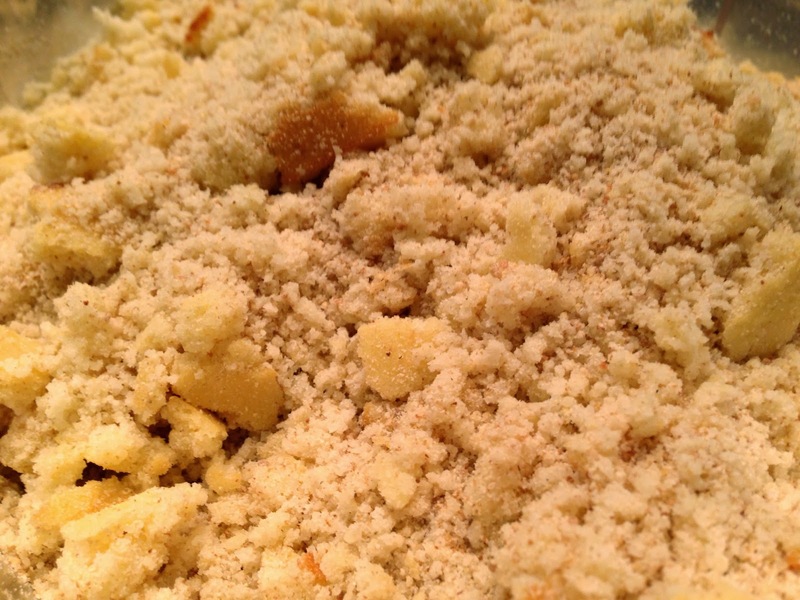 Crumble bacon; reserve 2 tablespoons for garnish. Add remaining bacon to potatoes; stir until blended. Garnish with reserved bacon and thyme sprigs. This week is all about Turkey Day. But have you planned what you'll do with the leftovers? I figured I would share an idea or two with you. This is the gourmet girl coming out in me...We have a French bistro in my hometown (Norman, OK) called La Baguette and it has been around for decades. They have the most decadent pastries, warm fresh-baked loaves of bread, soups, sandwiches and quiche...oh the quiche. It rocks my world. 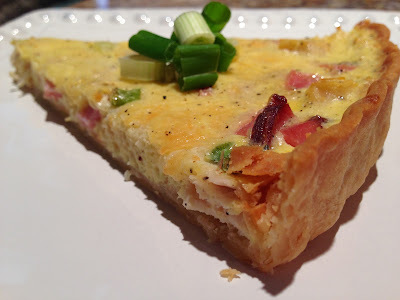 I used to think quiche was a hard dish to make because it sounded so foreign and fancy, and tasted so delicious that it had to take hours to create the perfection that is the French quiche. WRONG...It is super simple. I started playing around with different ingredients and figured out that quiche is not only simple to make, the filling combinations are endless too. 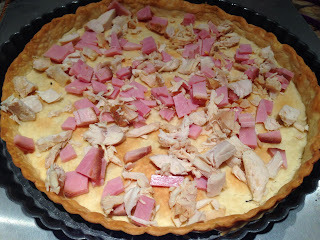 I'll list some other combinations at the bottom incase you decide that all you want to eat is quiche until Christmas! With all the leftovers I'll have from our Thanksgiving feast for 30 (yes...30!) I wanted to play a little off of my favorite ham and swiss quiche from La Baguette and put a little Thanksgiving twist on it. I would love to hear some filling combo ideas from you guys too! Just post them in the comments section below. Preheat oven to 450 degrees. 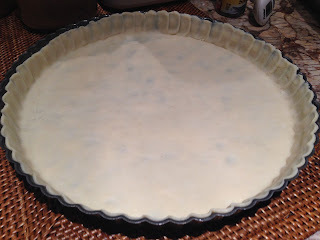 Press the pie crust into a pie dish or tart pan. Cover crust with 2 pieces of foil and bake for 8 minutes. 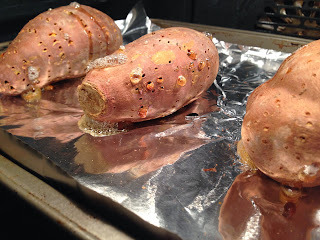 Remove foil and bake an additional 5 minutes. 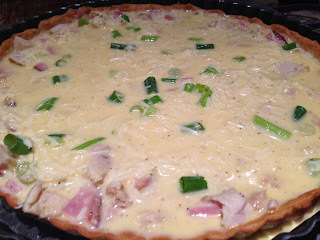 Spread turkey, ham, cheese and green onions over pie crust. In a bowl, whip eggs, half and half, salt and pepper. 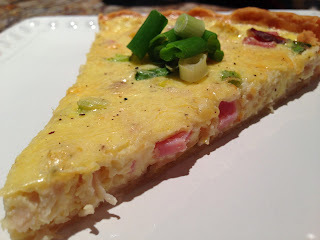 Pour egg mixture over the turkey, ham, cheese and green onions. Bake at 350 for 25 minutes or until the tip of a knife inserted in center comes out clean. 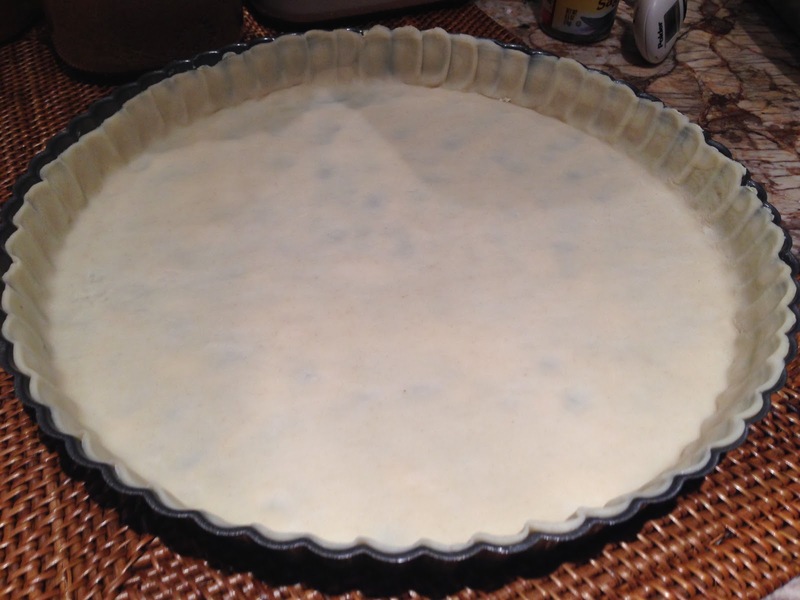 This time is for a tart dish which is much more shallow (about 1 inch deep) than a pie plate. 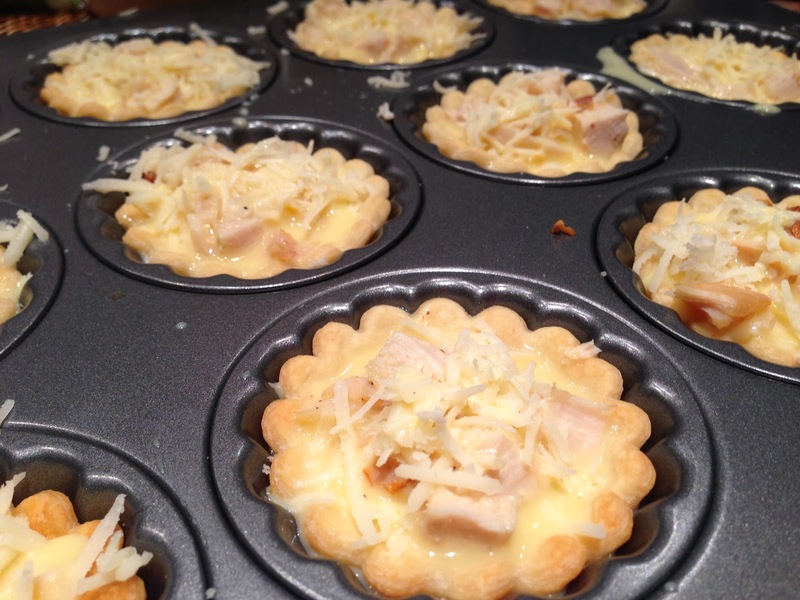 If you are using a pie plate you will need to add approximately 10 minutes. After removing from the oven, allow the quiche to rest for 10 minutes before serving. 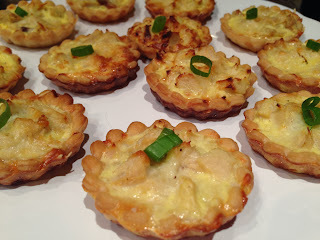 You can even make it into mini quiche for parties! Just in case you're living under a rock, or are deprived of a calendar....Thanksgiving is almost here! I'm freakin' out over only having 2 more days to prepare for all the cooking and then inevitable food coma that leads to me falling asleep while watching a football game. There are 5 or 6 staples to our thanksgiving feast, Dad's turkey, Mom's Ham, Grannie's stuffing, Nannie's candied sweet potatoes and Aunt Hooey's apple pie You guys are getting a family gem right here. 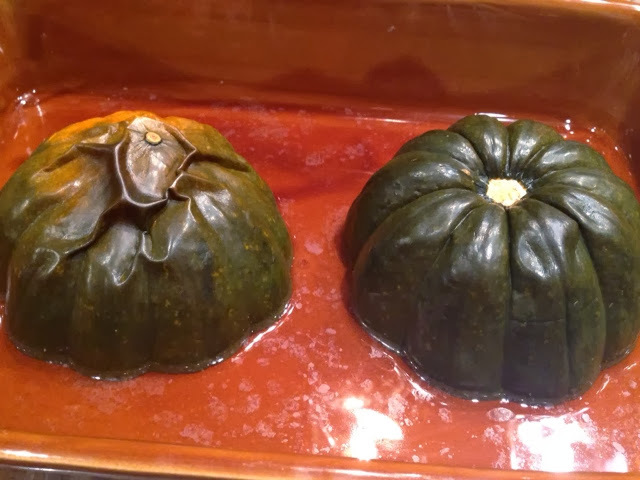 There was a few years that my Grannie was out of town for Thanksgiving and my sister and I got to compete to see who could get closer to the original neither of us got it just right the first year, the second and third attempts were much closer. Something about my Grannie making it, makes it just that much more perfect though. 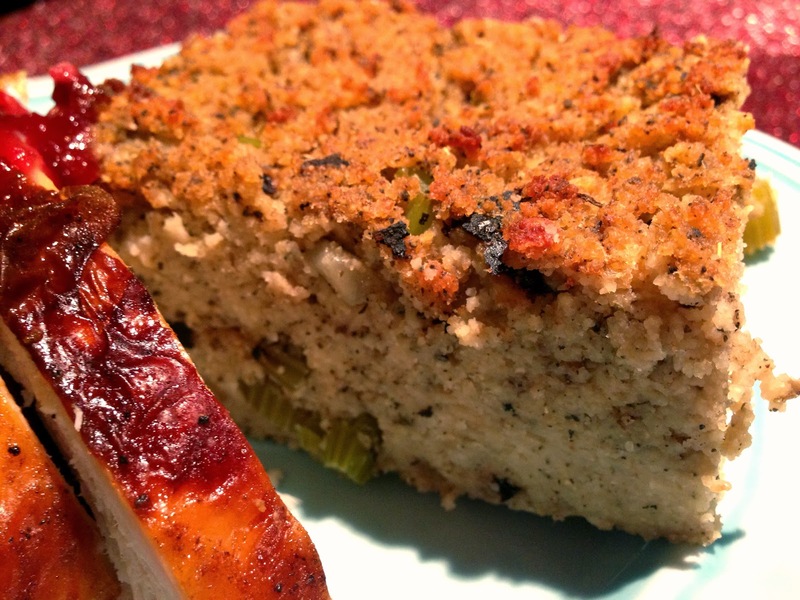 There has been a debate for years over the "right" way to make stuffing. My husband grew up on bread stuffing but I grew up on cornbread stuffing. His mom cuts up loaves of bread and let's the cubes of bread harden a bit before adding the stock and seasonings. My Grannie bakes a couple pans of cornbread and crumbles that up to add stock and seasoning to. 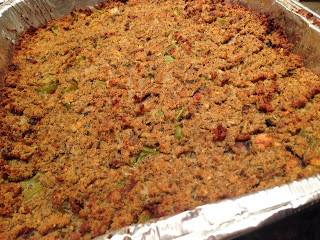 Our first year to do Thanksgiving together, the hubs was disappointed that we were not having bread stuffing that he was used to having on Turkey Day...We won him over though, and he thought ours was delicious (He may not have made it into the fam if he rejected Gran's stuffing!). You simply cannot compare the two, they are entirely different. But since I'm the one sharing the recipe...today...you get Grannie's version. Maybe next year I'll share my sweet Mother-in-Law's recipe with y'all and you can be the deciding vote. 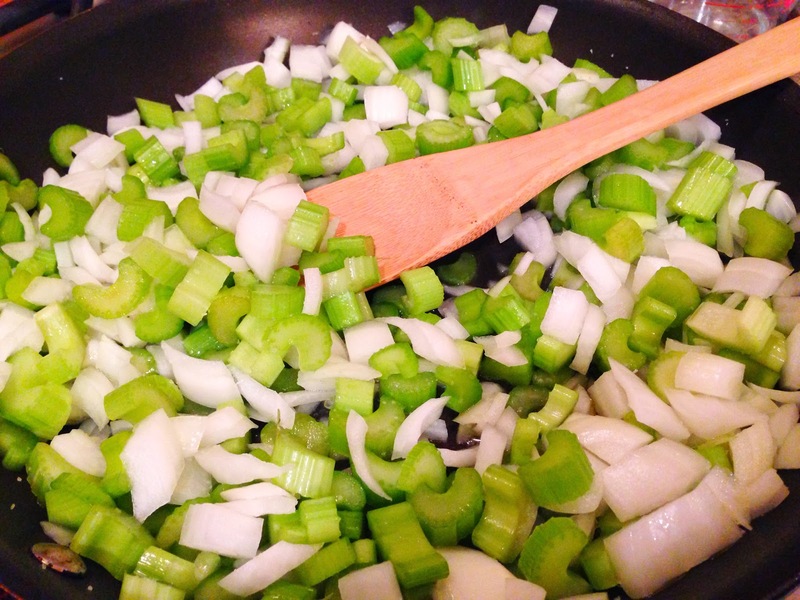 Sauté oil, water, onion, celery and salt. Cover and cook on low until tender but not mushy. Strain turkey broth (to keep bones out of stuffing). Crumble both crackers and cornbread and combine in a large pan. Add turkey broth, onion mixture and 1/2 bottle sage. 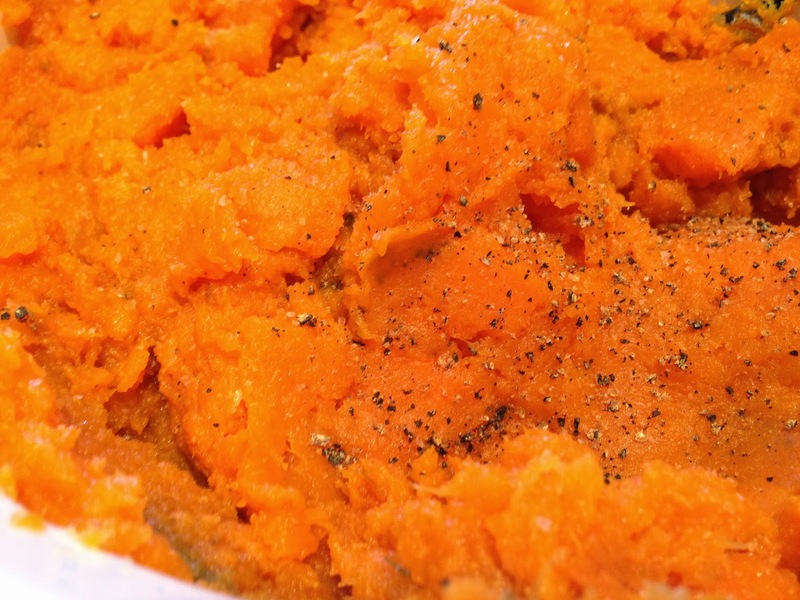 Use potato masher and mash as if you were making mashed potatoes. If needed, add more chicken or turkey broth to get the consistency you need. Add the other 1/2 bottle of sage and salt and pepper to taste. 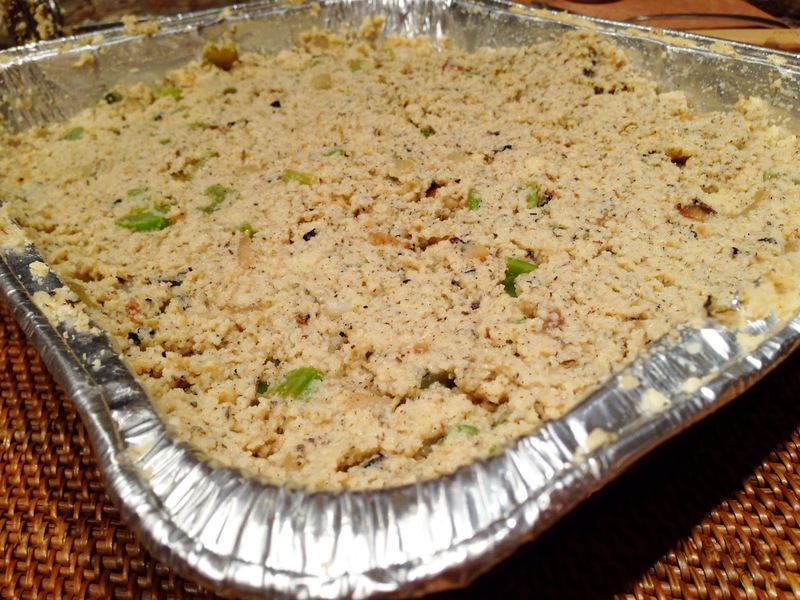 Be aware that the crackers are salted so make sure you taste it as you add it so not to over-salt. 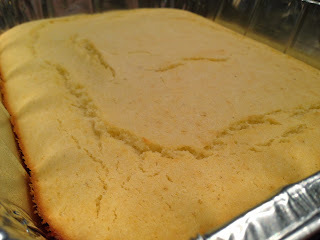 Pour mixture into 9x13 pans (should make 3 pans) Bake at 425 for 1 hour. After 30 minutes rotate pans in the oven (move top rack pans to bottom rack and bottom rack pans to the top rack), continue the remaining 30 minutes. Remove from the oven and let the feast begin! 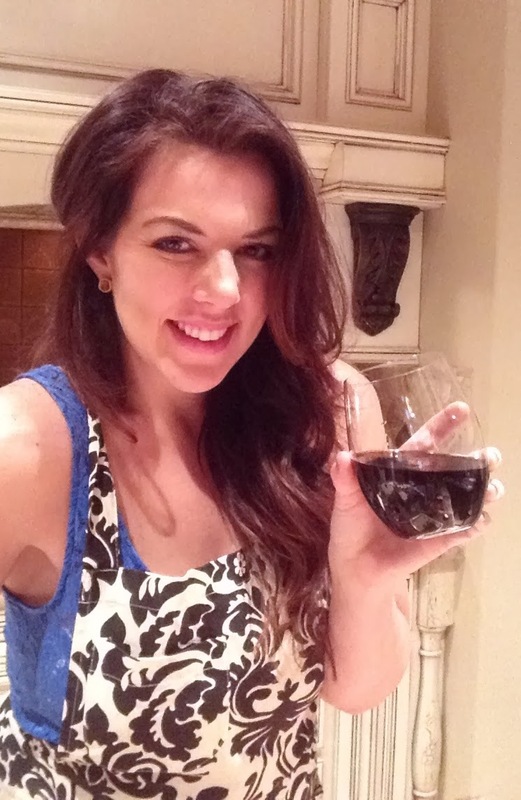 Cheers to all of you having a Happy Thanksgiving Day! First video to hit 1 million views! I have had such an incredible year living out my dreams and sharing all of it with you guys, my incredible fans. Without you, I would have no reason to do what it is that I get to do everyday. You are the reason I write songs and even more, the reason I sing them, so thank you for being you! I wanted to share this great holiday with you guys and "give" back in my own little way. One lucky fan will win an autographed copy of my album Whiskey & Lace before it's available in stores! 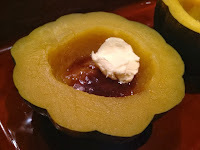 Just send your favorite Thanksgiving side dish along with a photo of you and/or the dish to TheBarnyardBistro@gmail.com and I will select one dish to make for my own Thanksgiving dinner next week. That winner will receive an early copy of Whiskey & Lace. May the best dish win! 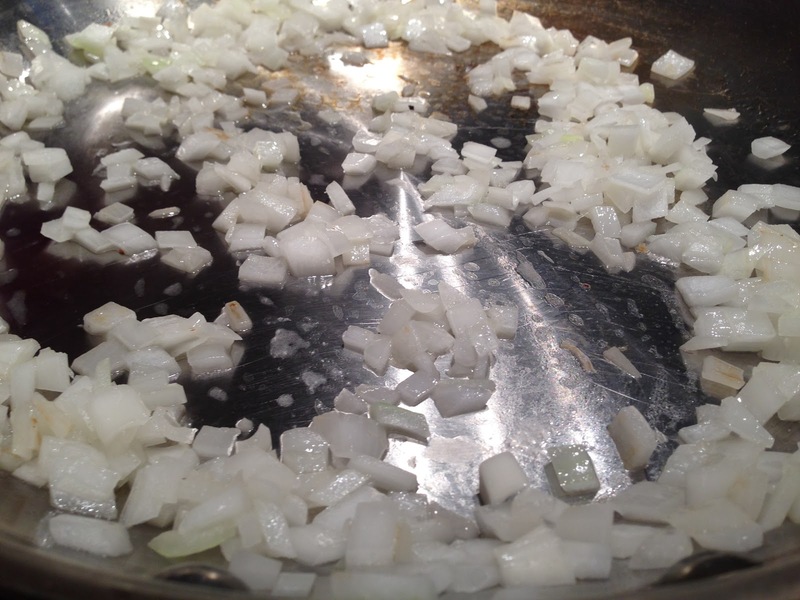 In a large skillet, over medium heat, combine the rice and water. Once the water is absorbed, add the pecan oil, sesame oil, onions and carrots. Toss for 3-4 minutes. Add salt, pepper, soy sauce and butter; Mix well. Push all of the rice to one side of the skillet. Crack the eggs and place them in the empty side of the skillet. Break the yolk and allow the eggs to cook about half-way before chopping and turning over to finish cooking. 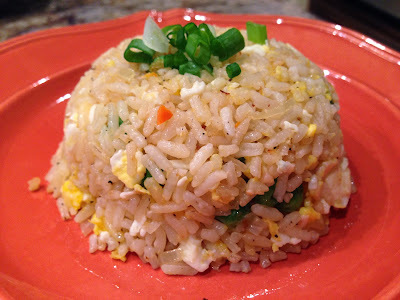 Once the egg is done, mix it into the rice. Toss rice for 2-3 more minutes. Add more salt and pepper to taste. Serve immediately. 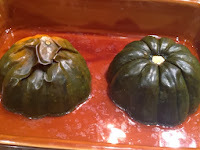 Note** If you want to serve it in a mound like they do at some of the Japanese steakhouses (like the image above), just pack the rice into a small prep bowl or side dish bowl and lay the plate on top. Hold the bowl and plate tightly in place and flip over, laying the plate on a flat surface. Wiggle the bowl gently and carefully lift the bowl away leaving a perfect mound of Fried Rice. 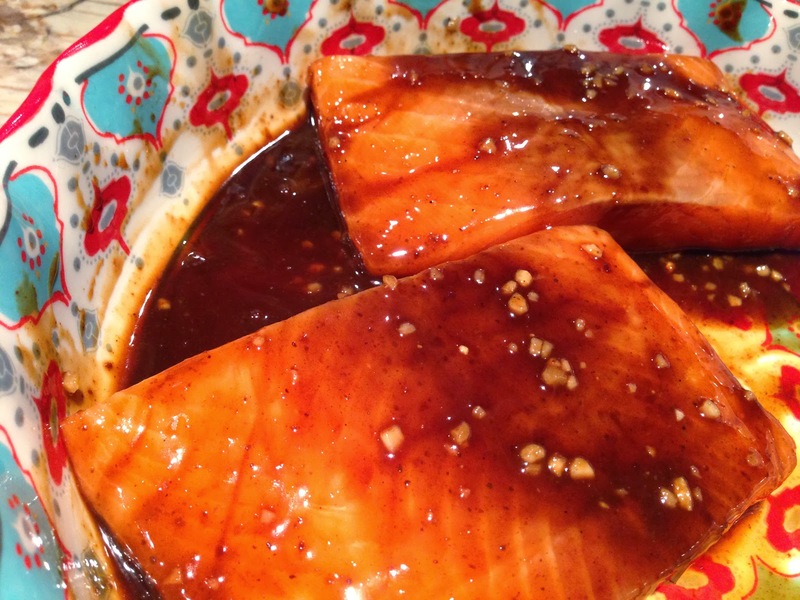 This side-dish pairs perfectly with my Broiled Hoisin Salmon from last week. Kacy, Dusty, Melissa and Gary Tellessen are the culinary masterminds behind the family operation. Kacy sweetly referred to his wife Mellissa as the 'queen of the side dishes." While he and his brother Dusty focus on the centerpiece of every carnivore's entree...the meat. He says that their dad Gary is the inspiration behind most of the recipes and still lends a hand from time to time. If you live or wind up in the Spokane area, give these guys a shout! 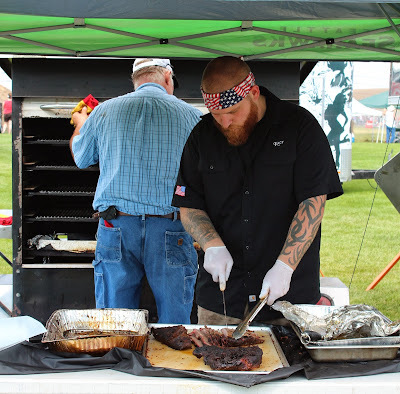 You can find Nordic Smoke BBQ on Facebook, just click here. They have a "roving BBQ trailer" that they roam around in making taste buds happy all over Spokane! They'll post on Facebook when they are out and about. 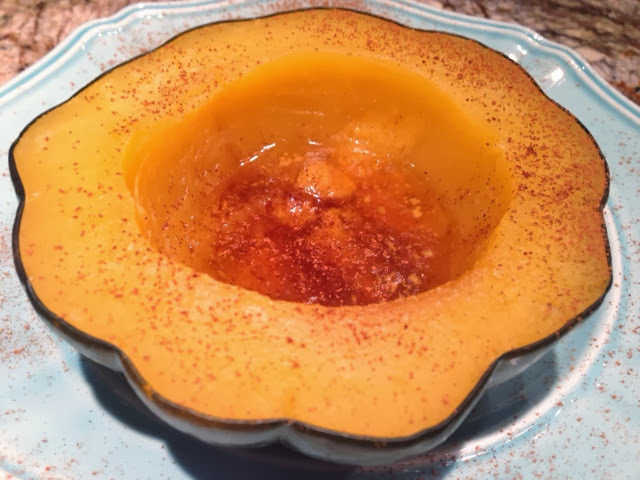 If you are not lucky enough to be anywhere near Spokane, you should still make a pit stop at their Facebook page to thank them for sharing this recipe with us. First crisp up the bacon until it is hard and crunchy. The liquid in the beans will re-hydrate the bacon so in order to avoid chewy bacon it is a must to crisp the bacon to the verge of burning. Dice the onion and jalapeño, if you like spicy don't seed or stem the jalapeño. Mix all of the ingredients together and the hard part is over. 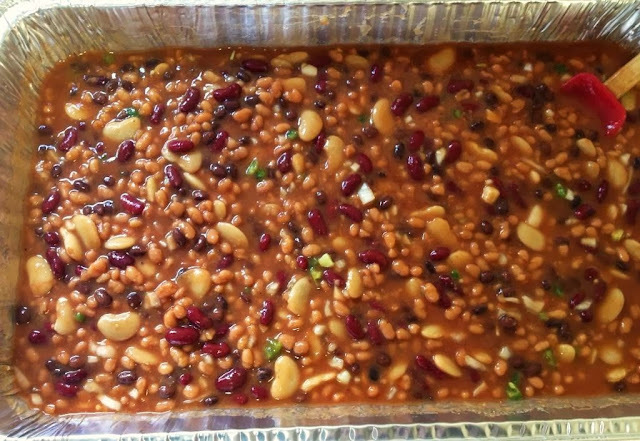 If you have a smoker I prefer to cook the beans uncovered at 225-250 for approx 3-4 hours or until the temperature of the beans reaches 165 degrees, but a conventional oven dutch oven or crock pot will work just about as good. Last night was a "throw something together night" because I haven't had a chance to visit the grocery store since I got back from my recent travels to Nashville and Indiana. 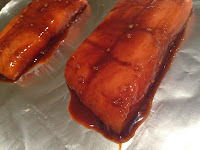 I always keep fish filets in my freezer (see my note below), so I pulled a few salmon filets and set them out to thaw. 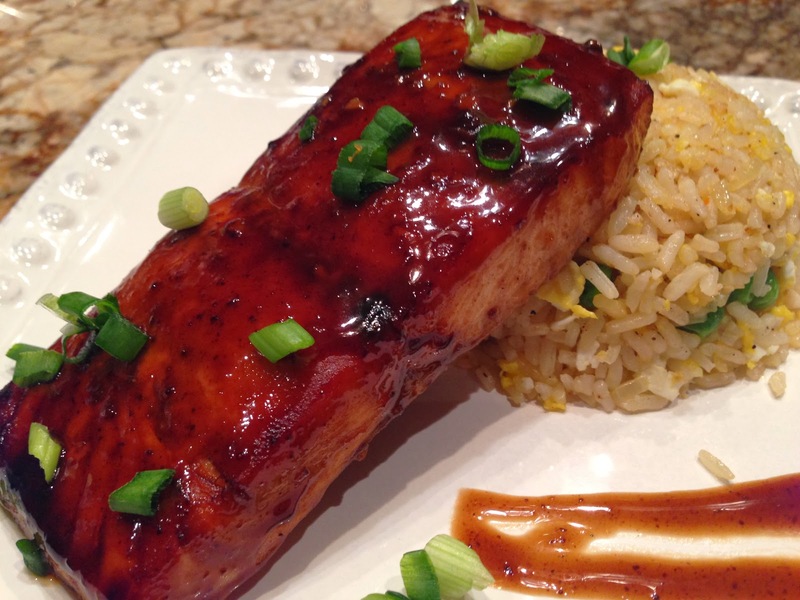 I wasn't in the mood for plain ole grilled or baked salmon, I really wanted a glazed salmon. While looking through the pantry my eye kept landing on a jar of hoisin sauce so I grabbed the jar and threw together this hoisin-glazed salmon recipe. 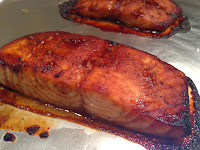 The salmon was perfectly tender and just slightly sweet. The hubs was gushing about how good his dinner was... which is the goal after all, right? The best part is that it took hardly any effort at all! Y'all let me know what you think! 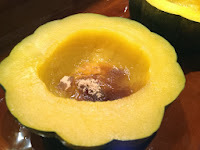 In a baking dish combine: hoisin, soy sauce, agave nectar, lemon juice, garlic and lemon zest. Add salmon filets and spoon the mixture over the salmon making sure to coat the entire filet. Cover and refrigerate to let marinate for one hour. Mix the glaze ingredients in an oven safe bowl, such as a mini soufle dish or a small Pyrex dish, and set aside. Turn on your oven's "Broil" setting and allow 5-10 minutes for it to heat up. Place the marinated salmon on a foil-lined baking sheet and into the oven. 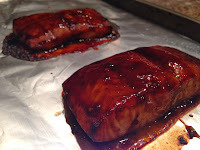 Broil for 12-15 minutes, depending on how well done you like your salmon. Place the bowl with the glaze mixture into the oven for the last 5 minutes to heat it up. Remove from the oven and baste the salmon with the glaze. 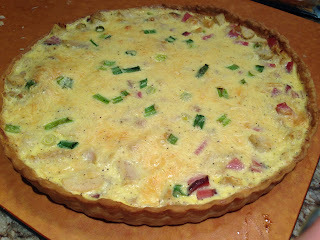 Sprinkle with fresh cut scallions and serve immediately. NOTE** I find that it is cheaper to hit up Sams Club or Whole Foods and buy the entire salmon side (or a couple of them) while its on sale and then portion it out yourself. This way you get to control the portion and you save a few coins in exchange for doing the extra work of cutting it into small filets yourself. I buy it fresh, portion it out and wrap each portion in plastic. I then fill a gallon-sized freezer bag with the filets and stick in the freezer. 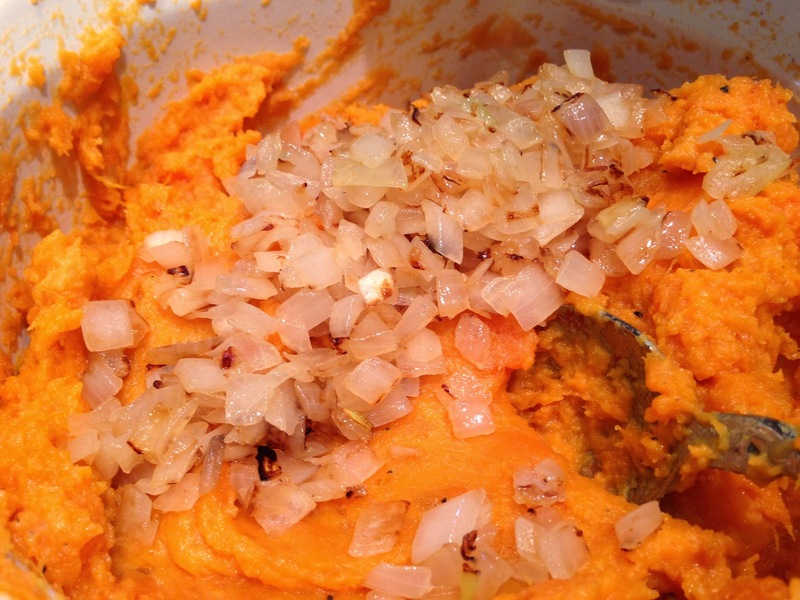 This is one of my favorite fall side dishes to serve to family and friends during the fall and winter. 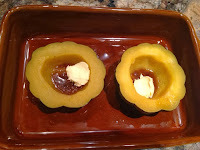 The presentation is beautiful, the squash is quintessentially "Fall." 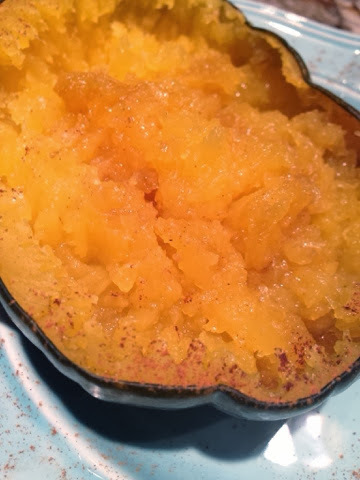 Each time I make this recipe I close my eyes and take in the smooth, creamy, sweetness of the first bite. 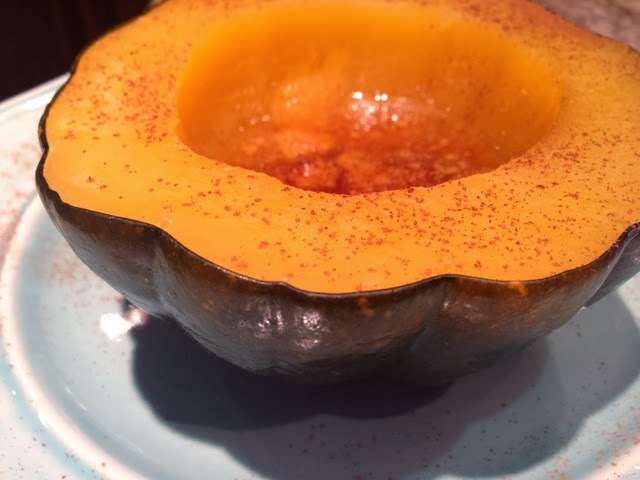 It is a super easy dish that often surprises guests that are not familiar with the winter variety of squash. 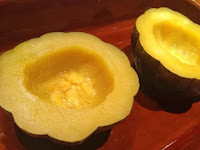 You can find acorn squash year round at the big name grocery stores, however, the season for acorn squash is considered to be late fall through winter. 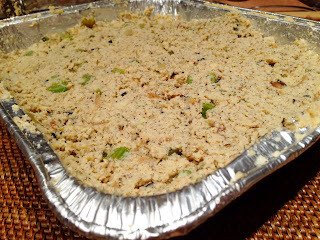 I have been promising many friends that I would get a recipe for this up soon and I'm finally fulfilling that promise. It's fitting that I share this recipe today because today is the kick-off of CMA week. I'm in Nashville doing radio and getting ready for both the BMI Awards and CMA Awards. Nashville, as you guys know from my CMA Fest post earlier this year, is one of my favorite places to visit...and eat! This is a tribute to our favorite appetizer at a Nashville hot spot Sperry's Restaurant, the BBQ Shrimp & Grits. I can't hardly eat shrimp and grits anywhere else because I am so spoiled with how delicious theirs' is. If you don't live near one of their Nashville locations, you should print this recipe off right now and head to the store to get started on it for dinner tonight. 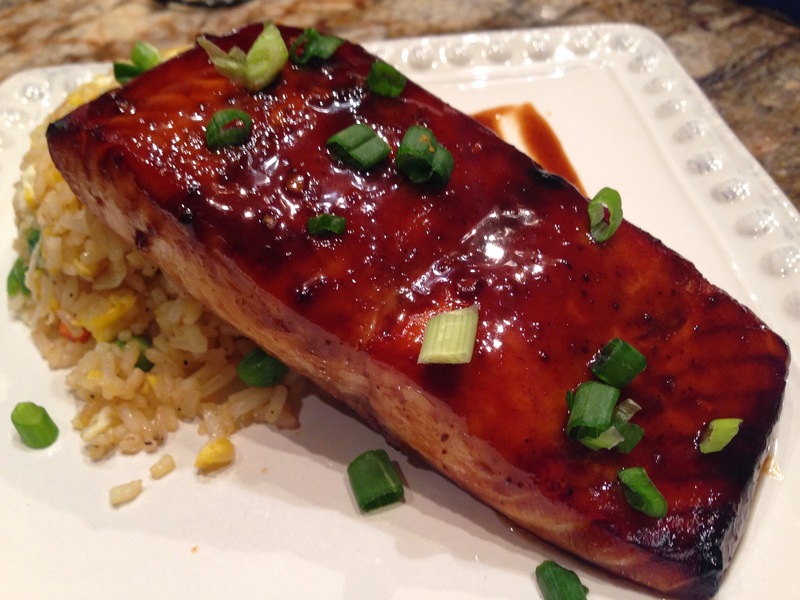 It is a meal you can whip up in under 30 minutes and is beyond delicious. Preheat your grill to about 350 degrees (I used a panini press grill). Rinse, peel and devein the shrimp leaving the tail in tact. 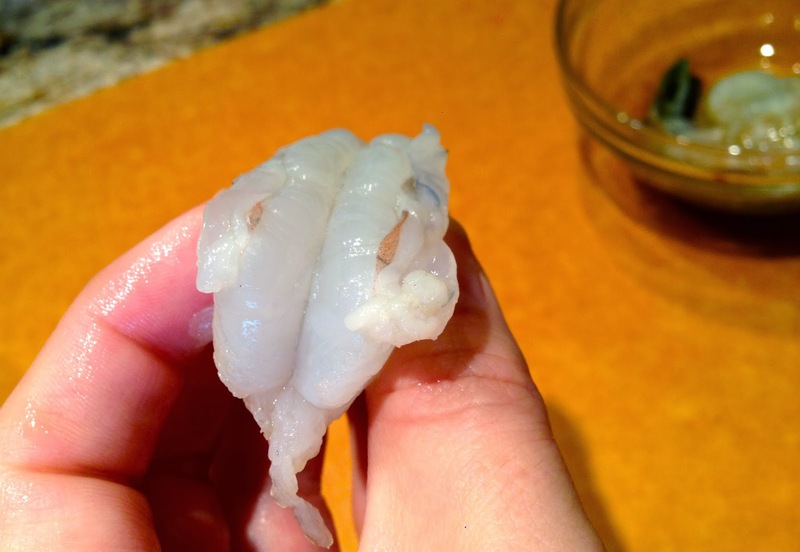 If you have never peeled and deveined shrimp before, use this tutorial from Epicurious to guide you through the easy process. 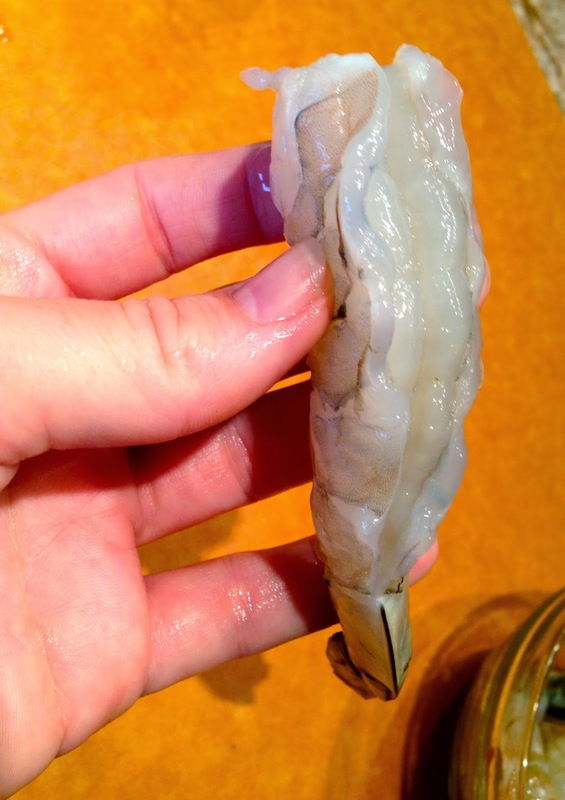 Rinse the shrimp and pat dry. 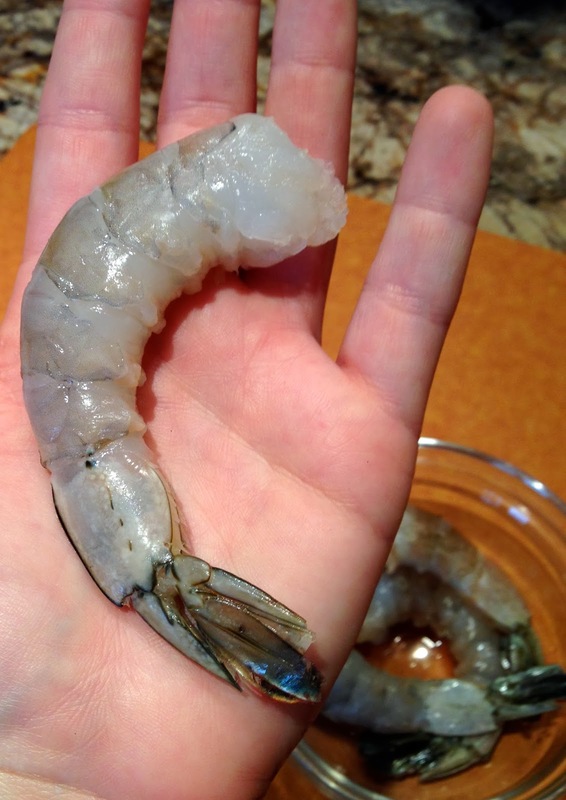 In a bowl, toss the shrimp with 3 Tbsp of BBQ sauce and a sprinkle of salt and pepper. 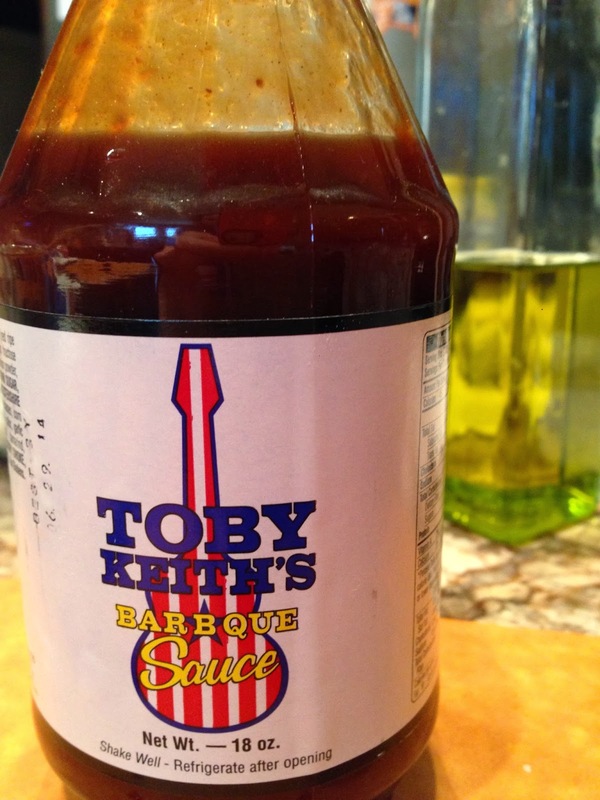 Let marinate while you continue making the bacon and grits. 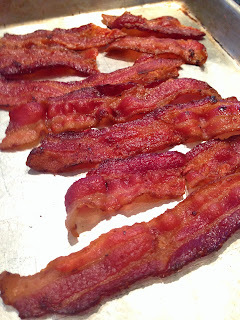 In a skillet cook your bacon over medium heat until crispy but not burnt. 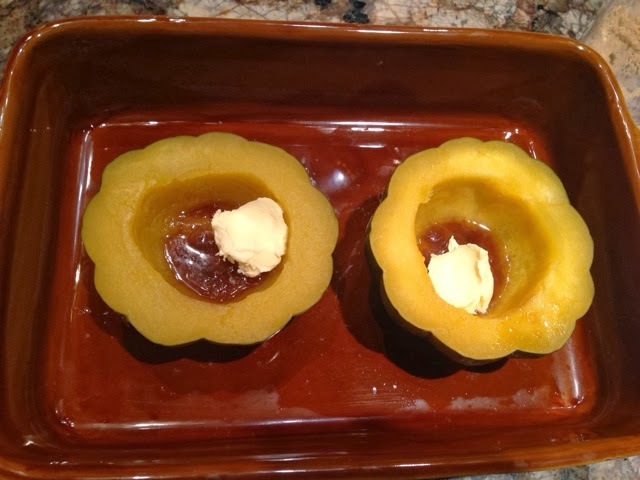 Remove from skillet and let cool. In medium to large sauce pan boil 4 cups water. Reduce heat to low simmer and slowly whisk in the grits. Continuously stir until the grits have become quite thick (just about 5 minutes). Add in the butter, milk, chives, 2 tsp of salt, 1/2 Tbsp pepper and the grated cheese. Stir until both the cheese and butter have melted. Remove from heat. Lay your shrimp on the grill and cook for 2 minutes on each side or until they are done all the way through (shrimp doesn't take long at all) While the shrimp are cooking, begin assembling your plates. A scoop of grits topped with a little grated cheese and bacon. Drizzle a little BBQ sauce (I way over did it in my dish so don't use my picture as a guide for drizzling!) 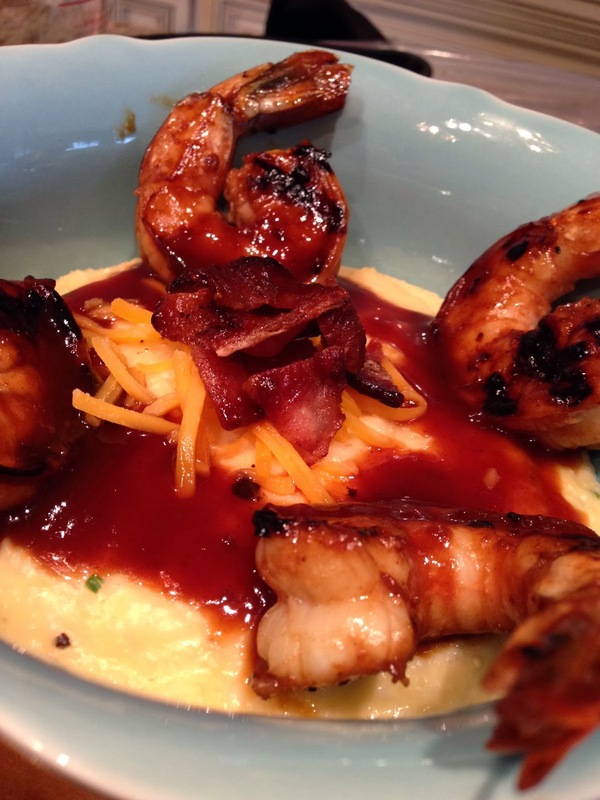 Pull the shrimp from the grill and brush with a little more BBQ sauce and lay in the dish of grits. Serve immediately! See my pictures below to check out my process - I forgot to show the bacon cooking but you get the point.